A few days ago I made a mistake with bottling the Super Stout. There’s a chance that it won’t taste good. I want to have something darkish to enjoy over the rest of winter. So it was time to do a back up brew, something a bit basic and small. Enter the idea of doing a brown ale. I spent a while playing around with a recipe ideas. In the end I decided to go with a really quick 30 minute boil and only two hop additions. Plus to keep the length of time down I wanted to do just four litres. Another factor keeping it simple and quick is to only use malt extract, in this case it was dry malt extract (DME). With the ingredients I had at home I couldn’t do an English style brown ale. Therefore I went with creating an American Brown Ale. Ingredients listed below. Some people really don’t like using kit yeast. For me it was easy because (1) I had some at home and (2) it’s a very basic darker beer. The darkness of the malt will help hide some of the less desirable flavours of the yeast, I hope. This was a three litre boil. First in went 400 grams of the DME. After the hot break went in the Warrior hops. Twenty minutes later the rest of the DME went in. Ten minutes after that flame out. Crystal hops went in. The pot was moved to sink to chill in cold water. About three trays of ice dropped directly into the wort. Only had to replace the water once for chilling. I was happy that it got down to about 22 degrees Celsius quite quickly. Then poured the wort through a sieve into the glass carboy which was then topped up to four litres. While all that was happening the yeast and nutrient was re-hydrated in some water on the side. 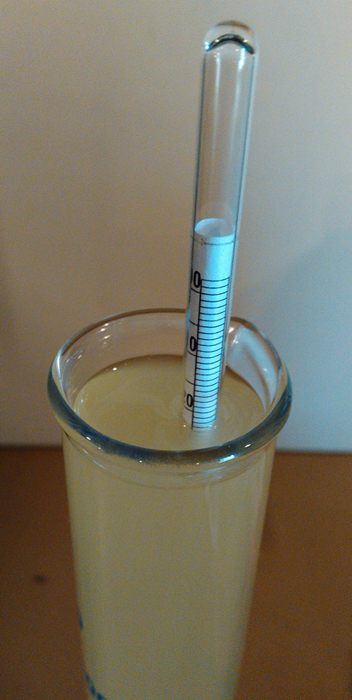 Before pitching in the yeast took a hydrometer reading which came in at 1.054. This should come in around 5.8% after bottling. That’s going to be stronger than the Super Stout! This was a very quick brew and only took about two hours to do. Was done by myself and I like that it was so quick. The wort tasted basic as expected. There’s not a lot of hops in there and plan was to keep bitterness down. Fingers crossed that this one turns out well. Will know in about a month. Keep an eye out as I’m going to be doing a lager style ale in the next few days. Last Sunday was another brew day at my place. It was a bit of a milestone date as I finally got around to doing bulk priming. Was also able to kick off what I hope is a series of pale ales. Chas made it over and we did a number if tastings through the arvo. First up was bottling the Baltic Porter #2. As I promised, this was to be my first bulk priming attempt. There was about 15 litres of useable beer. Problem was that I didn’t have another vessel that could hold that much. Ended up using the 9 litre pot that’s normally reserved for the boil. Did two lots of 6 litres and one lot of 3 litres. First attempt at bulk priming with fermenter, scales, pot and sample in the back. Used an online calculator to work out how much sugar to add. Sugar was put direct into the pot and beer was released over the top. Then stirred slowly to dissolve the sugar completely. In hindsight it would of been good to dissolve the sugar in some water first. Having just one vessel with one transfer would of been a lot easier. 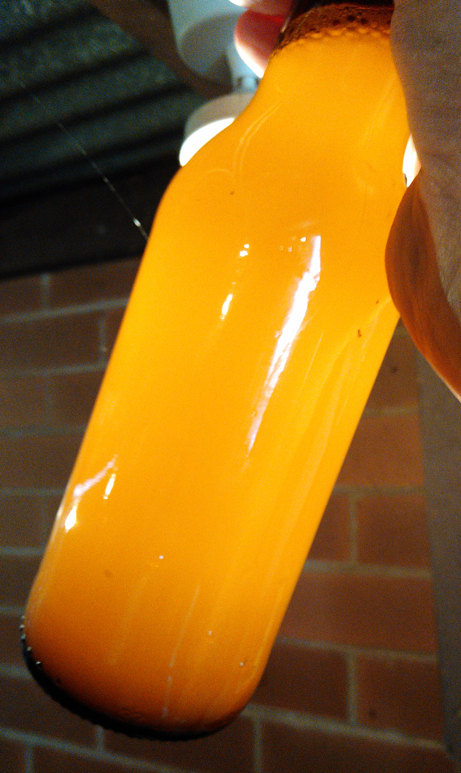 Bottling 15 litres with a syphon wasn’t fun. 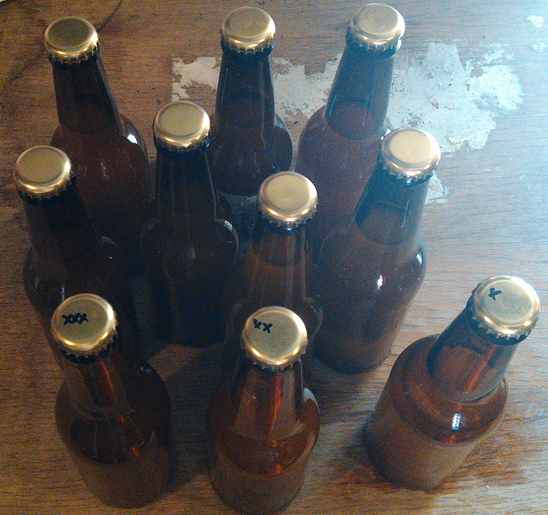 Most was done into 500 ml bottles which saved a fair bit of time. 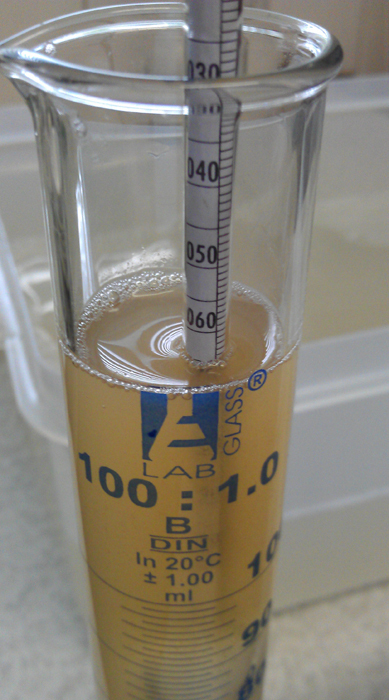 The final gravity came in at 1.032 which is a lot higher than expected. After bottle conditioning it should be 5.6% alcohol. That’s a lower than was hoping for. Really wanted this to be above 6%. That said it tasted pretty good when we sampled it. Time will tell. After bottling was finally done it was on to the brew. Plus there was a few brews up for tasting. The Aussie Wattle Pale Ale, Hoppy Heart IPA 2 and the two apple ciders I made. Chas will be posting about those over the next few days. I’ve been wanting to build out a range of lighter beers that can be enjoyed on the warmer days coming up. Not everyone in the house likes IPA’s and I’m not ready for doing a proper lager. Pale ale was the only good option. Given the failure of the last attempt I decided to avoid using liquid malt. So, dry malt was used and hops kept tame. As I used up a few things last brew this ended up as a single hop beer. That’s pretty exciting and will be a great benchmark, if it ferments out well. Before the brew started the yeast and a teaspoon of dry malt extract were thrown into a cup of water for rehydration. Realised after that should have waited before putting in the DME. Hopefully that doesn’t make much if a difference. Basic brew this one. Only a thirty minute boil. 2 grams Galaxy hops at 1 min /flameout. 1 & 1/2 teaspoons if US 05 yeast. 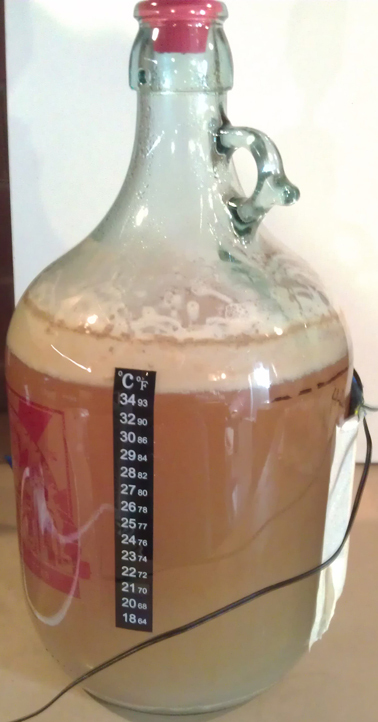 Australian Pale Ale 2 in the carboy after one week. As this was a small boil it was a lot easier to lower the temperature. Three trays of ice and some half frozen water went into the wort while sitting in the water bath. 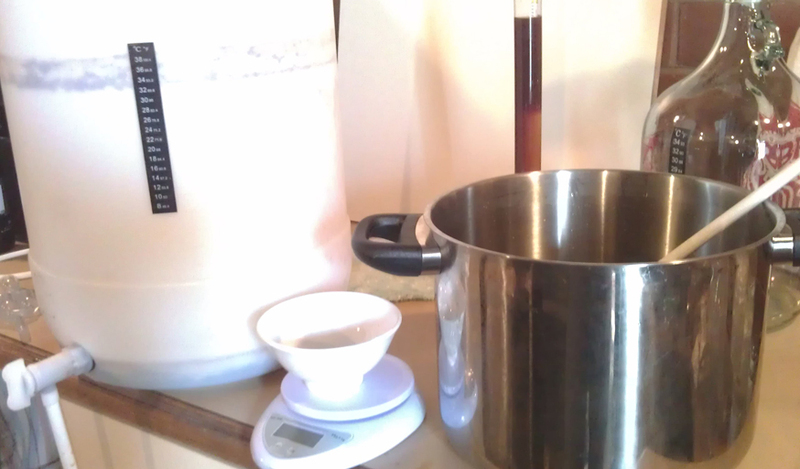 In less than 20 mins we were already down to 24°C and ready to pitch yeast. Last bit of water put in to get it up to four litres then given a good shake before gravity reading done. 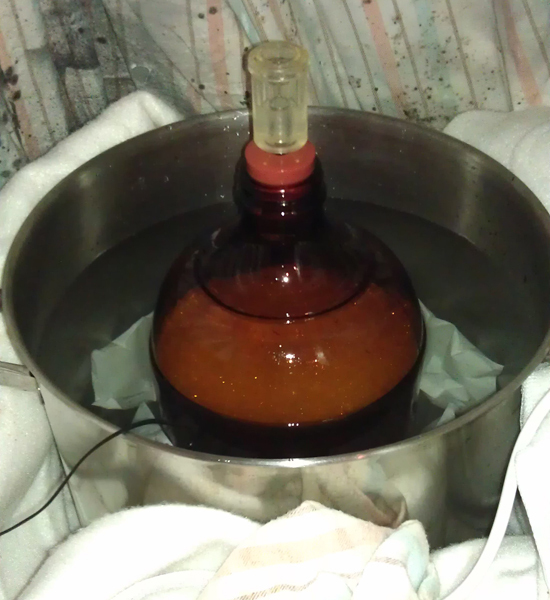 Original Gravity came in at 1.044. 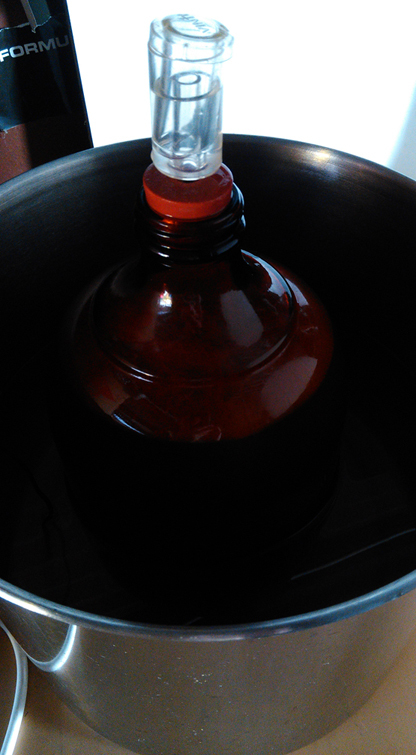 Airlock on, and done. Day was a good one. Had a late start and didn’t think it would be a long one. Turns out the bulk priming and bottling took a fair bit longer than I thought. Looks like I’ll need a proper vessel for the priming when I do it again. Really happy to finally get around to these two things. Next few brews will also be pale ales. But might need to slow down as we come into Christmas.